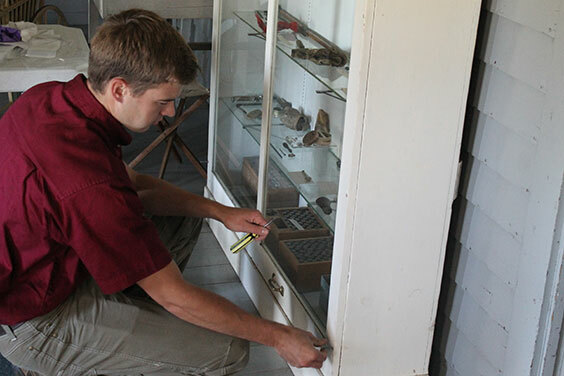 Last summer the Chateau de Mores State Historic Site had the pleasure of welcoming Quinn Rick from Dordt College (Sioux Center, Iowa) as an intern. As part of this internship, Quinn’s supervising professor, Dr. Paul Fessler, made a trip to Medora to check in on him. Our work with Quinn impressed Dr. Fessler, and he told Quinn that not many interns are so lucky. Our success with Quinn has to do with my philosophy on what an internship is. It is a pretty simple philosophy: an internship is a learning experience. 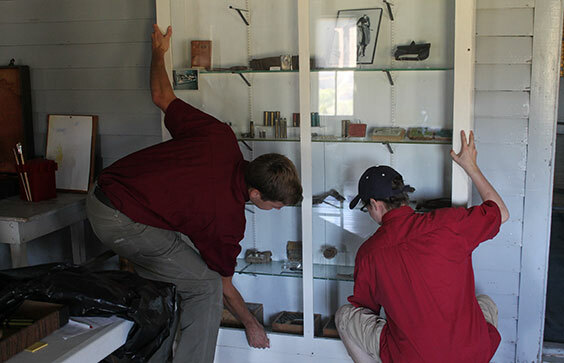 Chateau Intern Quinn Rick working on ammunitions exhibit case. It is all too common for companies or organizations to look at an intern as free labor or grunt labor. Interns fetch coffee and tackle the tasks that nobody else wants—the idea of “paying one’s dues.” The truth is that internships are about learning how to do a job. My background is in education. To me, my time student teaching was my internship. One of the best things that my cooperating teacher ever did for me was to hand the reins of the class over to me. I had done observation with him, and he wanted me to have the experience of teaching the class. On the first day, he introduced himself and then turned the class over to me. For the next 16 weeks, I was the teacher. I will always credit this experience with my classroom success. I wanted to give Quinn that same experience. I tried to train him to take my job.1 My job does not require me to fetch coffee for anyone, so I was not going to ask him to fetch coffee. I do clean the bathrooms and take out the trash in Chimney Park, and Quinn got to spend some time working with me on that. As we schlepped bags of refuse to the dumpster, I told Quinn that this was my site. How it looks and how visitors experience it is on me. But unlike my cooperating teacher, I could not just throw Quinn the keys and say, “It’s your site now, I will be back in September for it.” There are some things that he was not ready to handle on his own, but I did not shy away from teaching him these tasks. Instead of having him fill out the daily deposits and purchase orders, I went through them with him. I included him in meaningful conversations about site management and had him sit in on meetings. He went with me to a city council meeting and talked to me about how we handle all the difficult parts of the job. I have always been a jack-of-all-trades, and it means that I do a little bit of everything around the site. For that reason, Quinn did too. He gave tours of the Chateau, helped with inventory in the store, covered lunch breaks, and worked on other projects. Quinn helped with public relations and helped with the creation of Augmented Reality experiences in the gallery. He got to see other sites like the Former Governors’ Mansion State Historic Site, the North Dakota Heritage Center & State Museum, and the Billings County Museum. At each of these places, he got to talk to the folks who work there. They discussed the challenges facing their sites and the work that they do to overcome them. We wanted Quinn to leave here with an experience that he could put on his resume that was truly impressive. 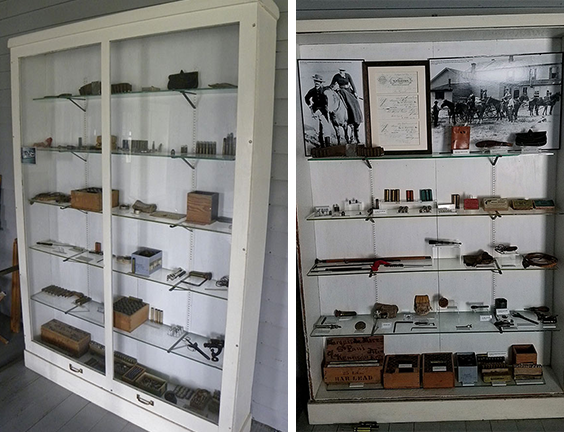 His big assignment was the reorganization of an ammunitions exhibit case that we have not opened in decades. He had to catalog the items, document his process, make decisions on what steps he needed to take to update the exhibit, and write up artifact labels. For this project, we also sent Quinn to Bismarck to work with Jenny Yearous, State Historical Society curator of collections. She taught him about various preservation techniques and how to handle artifacts properly. He worked with Genia Hesser, curator of exhibits, on solutions for making the case better. Quinn identified and organized the artifacts in the cabinet by category, removed excess artifacts, and created a list of needed labels to be printed. After putting his new skills to use, Quinn made the exhibit case look great, and we are proud of all his hard work. In the ten weeks that Quinn was with us, we threw a lot of stuff at him, and he handled it well. He was a valuable member of our team last summer. As our site moves forward, I hope to see us offer more internship opportunities. There are many projects that the staff and I want to get done out here. We are continually striving to have the best site. We have some pretty ambitious goals, and they are going to create some great opportunities for future interns. If you or someone you know is interested in interning at the Chateau de Mores, feel free to contact me at cdorfschmidt@nd.gov for more information. 1 This post was written when Chris Dorfschmidt was Site Supervisor at the Chateau de Mores State Historic Site. On April 1, 2019, Chris became a Historic Sites Regional Manager for the State Historical Society. He currently oversees staff and operations at the Chateau de Mores State Historic Site, as well as various other sites across North Dakota. As someone who is tasked with increasing public access to our archaeological collections, here is one of the biggest challenges: some artifacts are very small, while exhibit cases can be very big. In fact, archaeological artifacts that tell some of the biggest stories about North Dakota’s past can be measured in mere centimeters. When our average visitor might spend less than 20 minutes in an entire gallery, chances are high that the smallest artifacts could be overlooked.1 In a museum that comprises five galleries, thousands of displayed artifacts, dozens of tech and media installations, and tens of thousands of words of interpretive text — how do you help visitors appreciate some of the smallest representations of our state’s history? The first installation of the Small Things Considered artifact photo exhibit, 2016. When confronting this challenge in 2016 while planning for the 50th anniversary of the National Historic Preservation Act, we opted to display these collections in the form of a photo exhibit. 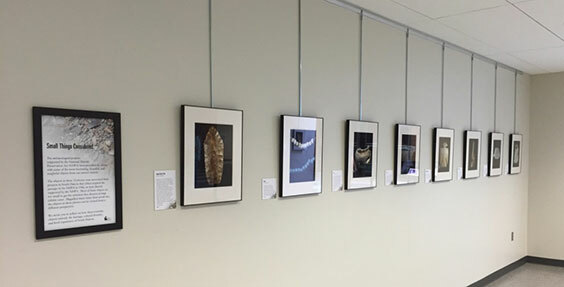 Titled Small Things Considered, the exhibit featured 12 large (11”x17”) color photos of archaeological objects. The exhibit was a hit, and ended up being an effective way to give some of our smaller collections the spotlight. So we decided to plan another one for 2019! Putting together this exhibit is a team effort. First we need the go-ahead from the Audience Engagement & Museum Division, which schedules exhibit spaces. Once the space is secured, our division director and collections staff brainstorm about what unique or interesting artifacts we have come across lately. Then we either find photos we already have of that object, or we take new photos. Sometimes we find an artifact that is amazing to look at, but we can’t include it — because we don’t know enough about it to write an informative caption, or we feel that it needs more context than this type of exhibit allows. Other times we might find an artifact we know a lot about, but we don’t include it because it doesn’t photograph well, is too big, or we have a similar example on display elsewhere in the galleries. This time around we started out with more than 20 photo possibilities, narrowed it down to 14, but couldn’t get to 12. They were all too good, so we just bought two more frames! Bone toothbrush recovered from Lt. Col. George Armstrong Custer’s home at Fort Abraham Lincoln, ca. 1872–1876. 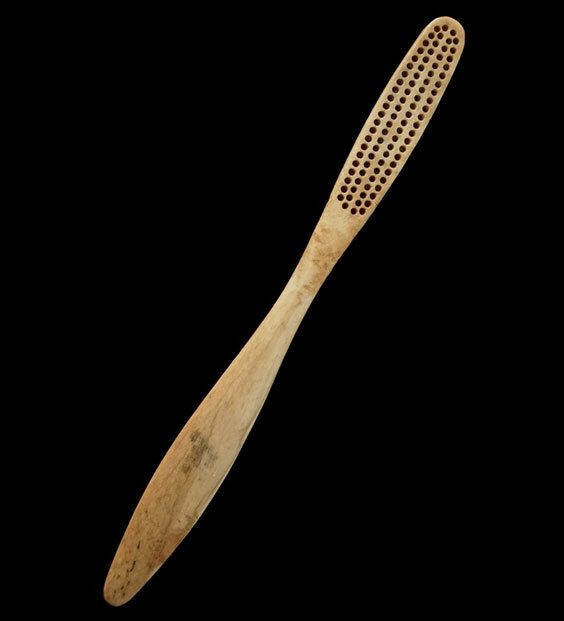 The holes in the head of the toothbrush would have been filled with tufts of animal hair, usually boar bristles. While our collections assistant Meagan processes the photos, I start researching each object so that I can write the captions. This is the best part. I have mentioned before that we manage millions of artifacts, so we always have a lot to do. There are a lot of emails, digital records, databases, paperwork, and phone calls involved in managing a collection this size, which means that there are many days that I do not handle a single artifact. But this exhibit project affords me the luxury of focusing on one artifact at a time. I have always considered it a privilege to take care of these objects, and I take any opportunity I can to get to know each one of them better. There are objects that I initially think I am not interested in (e.g., coins come to mind), but after a few hours of research, I find myself talking to anyone who will listen about the history of the nickel or the miracle that is a fish scale. And if I am being honest, not all of this is rosy — I also spent an afternoon tearing my hair out trying to identify the Tiffany & Co. design on a silver spoon (extra challenging when the handle — the most identifiable feature of an historic spoon — is completely missing). I’d like to introduce you to my new favorite nickel, which dates to 1866 and was found near Fort Rice. 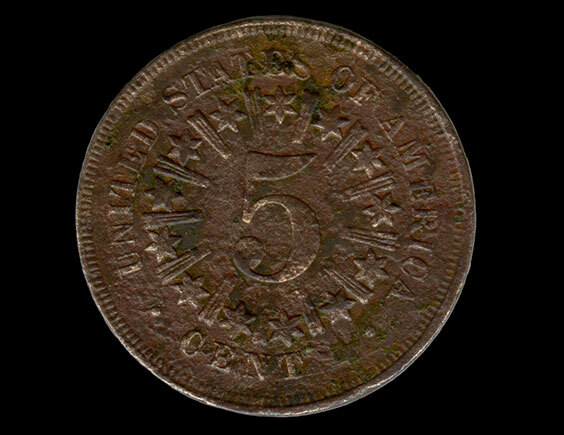 The rays around the “5” were believed to have complicated the striking process when these were minted. The coin’s design broke the dies or resulted in a coin whose features were not as sharp in relief as they should have been. For these reasons, the rays were removed from the design in 1867. This object represents a shift in minting practices after the Civil War. An 1866 Shield Nickel, the first 5-cent piece to be made from a nickel-copper alloy. While researching the clay horse figurine from the 19th-century site of Fort Berthold pictured below, I came across a historic photo that explains who likely made it. 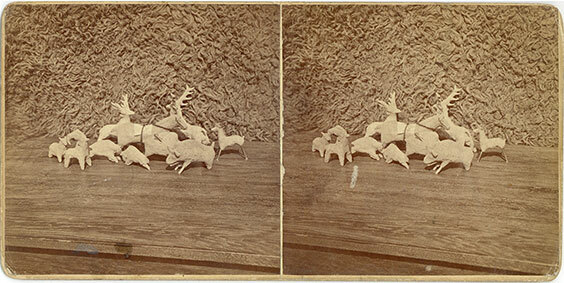 It closely resembles the clay figurines made by students at the Fort Berthold Indian Mission School during the 1870s. Note the detail in the horse’s mane, and the eye on the side of the (broken) face. Another less complete example in the same collection has holes in the bottom, which appear from the historic photo to have been used to insert small twigs for legs. The founder of the mission (1876), Charles Lemon Hall, learned all three languages (Mandan, Hidatsa, and Arikara) spoken by the students who attended the mission school. 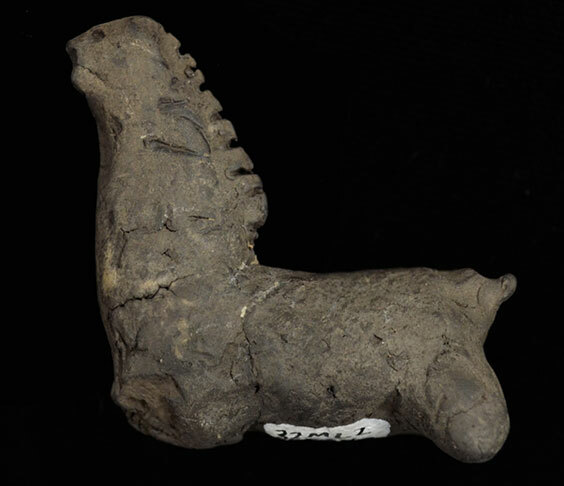 Clay horse figurine from Fort Berthold, ca. 1870s. The shell bead pictured below is about ¾” long. In a typical exhibit case (which is about the size of a small closet), its details might easily be overlooked when surrounded by larger or more colorful objects. But in this picture, you can see that the pointed spire at the top has been lopped off, which creates a hole through its body. You can also see the variegated color near the top, and the texture of the whorl. 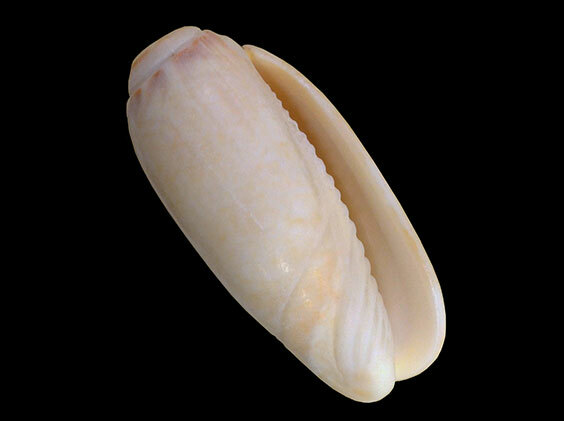 These Olivella shells (Olivella dama) are from the Gulf of California and made their way along trade routes to North Dakota. The presence of Olivella shells in this region demonstrates the extent of trade networks between Native groups long before Europeans arrived. 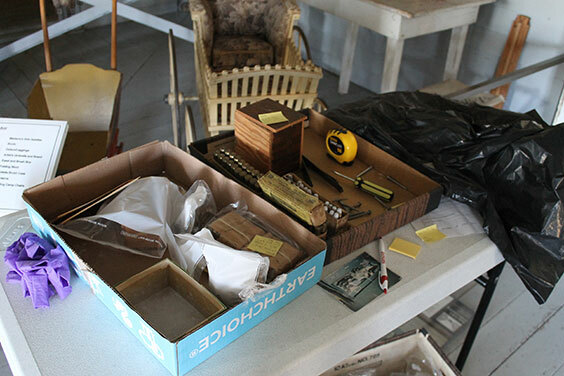 It is important to display artifacts in the context of where, when, and with what other objects they were found, and our exhibit cases achieve that. The context of an artifact tells the story. This photo exhibit does not diminish the importance of context, but rather brings the beauty and details of individual objects into focus. Stop by the Merlan E. Paaverud Jr. Gallery outside the auditorium the next time you find yourself at the North Dakota Heritage Center & State Museum, and see for yourself! 1Average visitor time tracking statistics can be found in Exhibit Labels: An Interpretive Approach by Beverly Serrell, 1996, AltaMira Press.